Donald Trump cancels trip to Israel, meeting with Netanyahu. 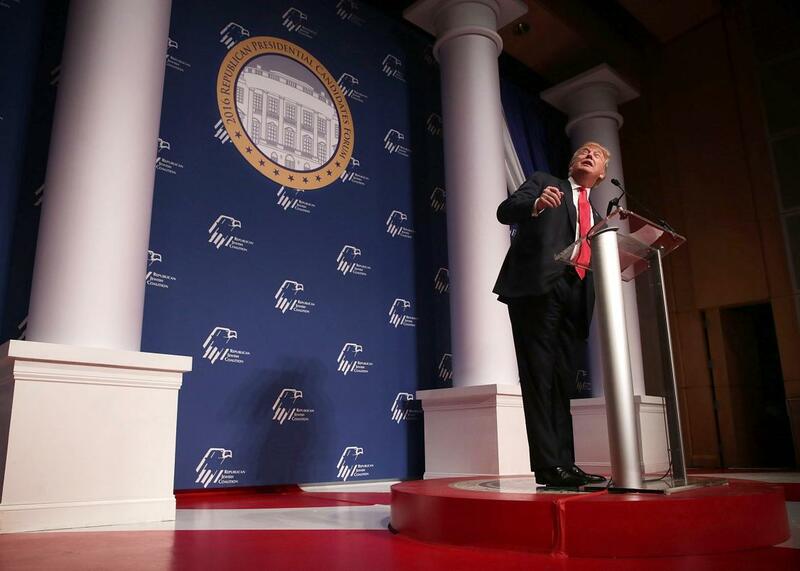 Donald Trump addresses the Republican Jewish Coalition at the Ronald Reagan Building and International Trade Center on Dec. 3, 2015, in Washington, D.C. The GOP front-runner was planning to meet with Israeli Prime Minister Benjamin Netanyahu during a trip to the country on Dec. 28 and was also reportedly considering a visit to the Temple Mount, a flashpoint for recent unrest in Israel and the West Bank. The trip, though, was scheduled before Trump called for the United States to ban Muslims from coming to the country, a proposal that has been met with widespread condemnation around the world (though not necessarily among Republican voters at home). On Wednesday, roughly three-dozen members of the 120-seat Knesset signed a letter calling on Netanyahu to condemn Trump’s remarks and to cancel the meeting. Netanyahu ultimately did the former—his office put out a statement saying he “rejects Donald Trump’s recent remarks about Muslims”—but left it to Trump to do the latter. As my colleague Joshua Keating pointed out earlier this week, Trump is a big Bibi fan. He has endorsed Netanyahu’s re-election bids, described him as a “terrific guy,” and expressed regret that he can’t be president of the United States. Netanyahu, unsurprisingly, isn’t prepared to do the same for Trump.